Carbon composites are generally considered 4 times lighter than most steels. Density of Steel is 7.8 kg/m3. Density of Graphite Damping Composite is between 1.4 and 1.8 depending on composition. Damping is up to 20 x better than steel when damping material is included in the Composite. The inclusion of damping material will reduce the Composite E-Modulus, but the resulting Composite E-Modulus is still similar to standard steels. The positioning of damping material in the component is an important element of the design process. E-Modulus of a Graphite Layer in the direction of the fibre can be over 400GPa using 760GPa fibre. a Quasi-Isotropic “Steel Equivalent” complete laminate will be an E-Modulus of 150 GPa, in both X & Y directions, hence the need to use 1.3 times the thickness to maintain the Equivalence of 210 GPa steel. Optimising the stiffness in different directions or between bending and shear stiffness is a normal part of the design process which is not possible with steel. The maximum strength of a “Steel Equivalent” composite is about the same as the yield point of standard steel at about 385 Mpa. Many Machine Components need Stiffness or Damping rather than strength and the volumes of material necessary mean that the stress levels are consequently very low. Composites do not have a yield point. Composites could micro crack in the matrix at about 75% of ultimate load. This can be considered to be the composite equivalent of a yield point. 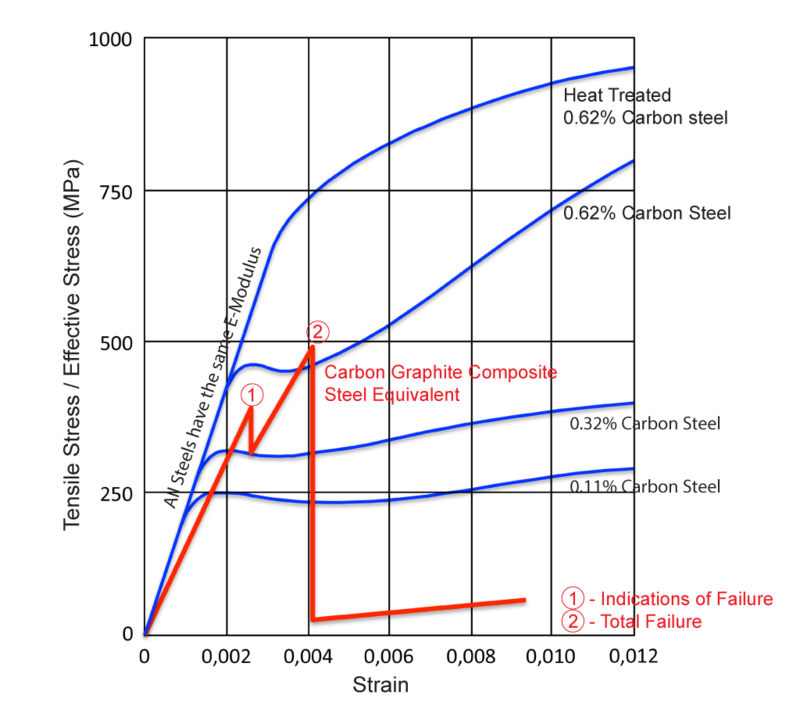 However, unlike steel, the E-Modulus does not change and the stress strain curve is a straight line until failure. 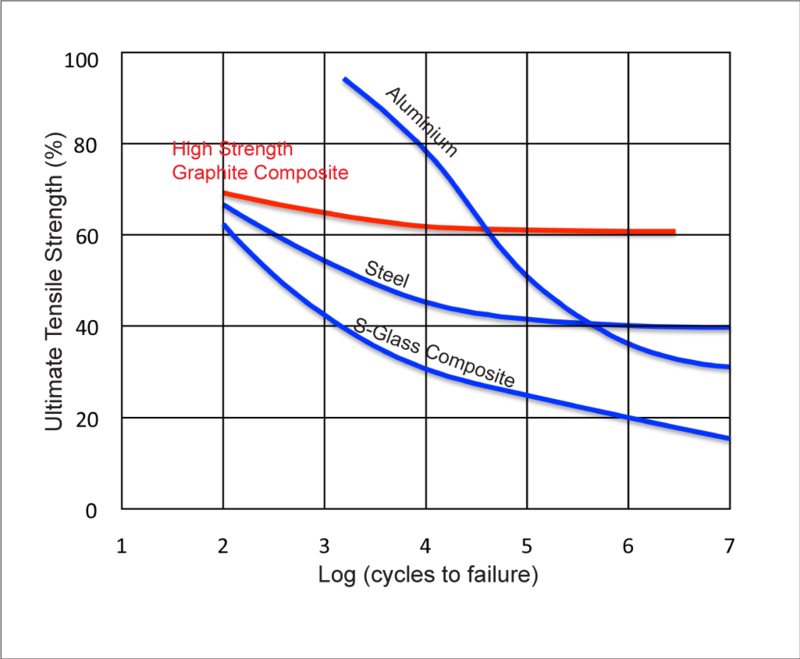 Composites fail in Compression or the compression side of bending at about half the tension failure stress levels. The SN curve for Carbon Fibre Composites is very flat and significantly better than steel. PAN fibre has a positive coefficient of thermal expansion. Graphite fibre has a negative coefficient of thermal expansion. When made into a composite it can be designed to have zero expansion in a specified direction, provided this does not conflict with other required properties. In Composites it is not good to cut the fibres that are responsible for stiffness or strength. It is usual to add an extra layer of some material in order to create a machined surface. Carbon Composites machine well, but require special equipment for the safe disposal of dust or slurry. Accuracy of tooling dictates the accuracy of the part and this is very useful in obtaining accurate inside dimensions without machining. This can be a significant saving. Carbon Graphite Composite does not have the toughness or hardness of steel. If there is a danger of damaging contact it is necessary to design some protection. Most machines already have external covers, so this is not usually an issue. For constant contact pressure it is possible to use a local coating to improve surface hardness. 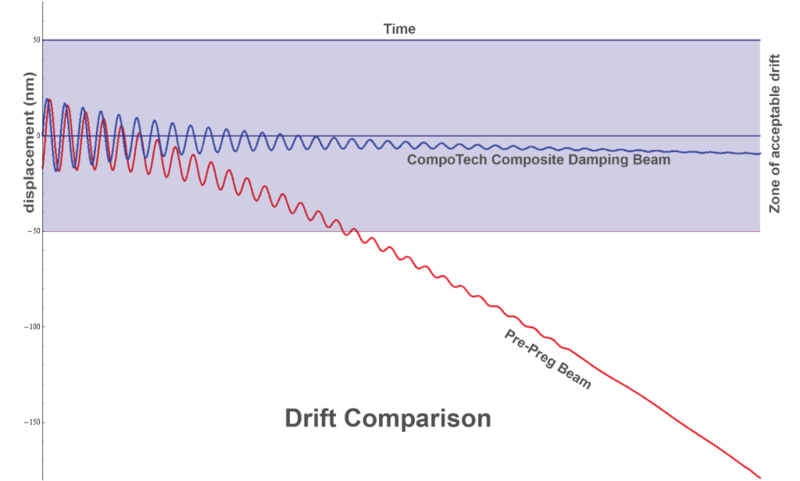 Experimental measurements show that for precise positioning of a beam the CompoTech Composite is better than Prepreg Composite. The Prepreg beam would drift over micro-time and loses its positional stability. The reasons are that residual stresses are built into the prepreg beam during curing. Epoxy Composites do not corrode. Epoxy resins are impervious to fluids, and a good composite has very low voids. However, if the composite is machined the surface of both the resin, any filler and the fibres may be cut. Anywhere that is machined needs to be re-coated to ensure a good seal. The Epoxy Resin Matrix is chosen partly for its temperature performance. Anywhere in the range -40˚C to +200˚C is normal. Higher temperatures may be possible. UV is a problem for Epoxy Resins and there are many additives to reduce this degradation, However, this is only a surface problem and can be overcome with the correct choice of coating should there be any danger of UV. Once a Composite is manufactured, the only health hazard is dust from the machining, grinding or sanding of it. This is overcome by the use of fluids or strong air suction to remove any particles. Unwanted composite is chopped and the matrix burned off to recover the energy trapped in the chemistry. The short fibres are used for reinforcement in injection moulding or concrete. Other possible recycling processes will convert the material back to basic elements.